Atletico Madrid star Fernando Torres has emerged as one of Europe's hottest striking sensations. 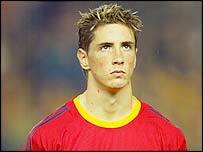 A boyhood Atletico fan, Torres was handed the captaincy of the team at the age of just 19. He scored 13 goals in his first full season in La Liga and the 2003/04 season has proved to be equally prolific. Torres missed a penalty on his debut for Spain, but has since impressed coach Inaki Saez with some eye-catching displays. He causes defences problems with his sheer pace and strong aerial presence. And he has emerged as the leading light in a highly promising crop of Spanish youngsters which includes Arsenal's Jose Antonio Reyes and Joaquin, of Real Betis. Did you know? Torres scored Spain's winning goal in the final of both the 2001 Uefa Under-16 Championship and the 2002 Under-19 Championship.